A new ranking of America’s top cities for bicycling, courtesy of the bike industry-funded advocacy organization PeopleForBikes, has a slightly different take on the usual suspects. Fort Collins, Colorado, gets the top spot in the new ranking, while Portland scored the highest among large cities. No surprises there. But Tucson and San Diego landed in the top five among large cities, ranking ahead of Minneapolis, Seattle, and San Francisco, which is a bit of a curveball. And PeopleForBikes stresses that even America’s best bicycling cities leave a lot to be desired. Nowhere ranked higher than a three on the organization’s five-point scale. The new PeopleForBikes rating system attempts to ground the results in hard metrics. It’s based on several spatial and quantitative factors, including the availability of high-quality bike infrastructure, traffic injury rates, and how much people bike. Because the ratings also take recent public investments in cycling into account, PeopleForBikes expects them to be volatile. While the rankings only include American cities, they’re also intended to hold the U.S. up against the world’s best places for biking. No city received more than three stars out of a potential five-star rating. “As much as it might hurt not to have any superstars, that’s honest,” PeopleForBikes President Tim Blumenthal told Andersen. my hometown of Wausau and former home of Madison on the list! yeah! Madison was the only place I commuted by bike, and it’s a nice city for it (at least when it’s warm). While I am pleased to see Washington take its rightful place on the list, I am very surprised not to see Philadelphia. As a New Yorker visiting each of those cities just to ride there, I have been very impressed with both cities’ bike infrastructure. Philly is notable for having a bike lane network that touches all parts of town, including the remote Northeast, whereas New York’s bike lanes tend to be concentrated in Manhattan and in the sections of Brooklyn and Queens that are nearest to Manhattan. Still, despite the skewed distribution of New York’s bike lanes, the sheer number is remarkable, and makes navigating the city’s core very easy. Also, while bike lanes are not abundant in the outer boroughs, there are several extremely important ones far from Mamhattan, such as Bedford Avenue and Queens Boulevard. So for New York not to appear on the list is very strange. I’m very confused as to how their methodology allows Davis to score relatively so poorly? I mean, is it honestly worse than San Jose, Los Angeles, or Columbus OH? Fort Collins is doing great things, nice to see them get recognition. Madison is a “Large city”? By virtually any measure they fall into the midsize category. All of these rankings have to be taken with a grain of salt. And the rankings rely on self-reporting, subjective impressions, and inconsistent data gathering. Comparing some known cities I’m left scratching my head how they would arrive at some of the rankings. I recognize this is taking a different approach to grading, but does Chicago deserve to rank 79th? Since Davis was one of the earliest movers in building bike infrastructure in the 1970s there’s less low hanging fruit to harvest. It is harder for cities like Davis to score well on the “recent investment” score. If let’s say copenhagen or amsterdam are 5 star cities, then by that scale every single one of these cities should score less than 1.
compared to (name any city in germany, belgium, the netherlands or denmark) even Portland is a scary place to ride a bike. The “acceleration” indicator is not a great metric. It’s a significant % improvement for a bottom tier city like Houston to go from absolutely no bike infrastructure to a few sharrows vs. Seattle slowly going from bike lanes to fully protected bike lanes. Just because a city is making a lot of progress from nothing doesn’t mean it’s a good place to ride. Well, that’s why there are other metrics to build the total score. Not all the metrics should be weighted equally. Does San Diego have a single mile of protected bike lane ? Arguably, Amsterdam and Copenhagen are solid 4.5s. Nowhere ranked higher than a three on the organization’s five-point scale. Good, that means that it will potentially be more useful than the LAB BFC ratings. That’s why all these measures shouldn’t be weighted the same. Davis is arguably one of the best, if not the best, places to cycle around. 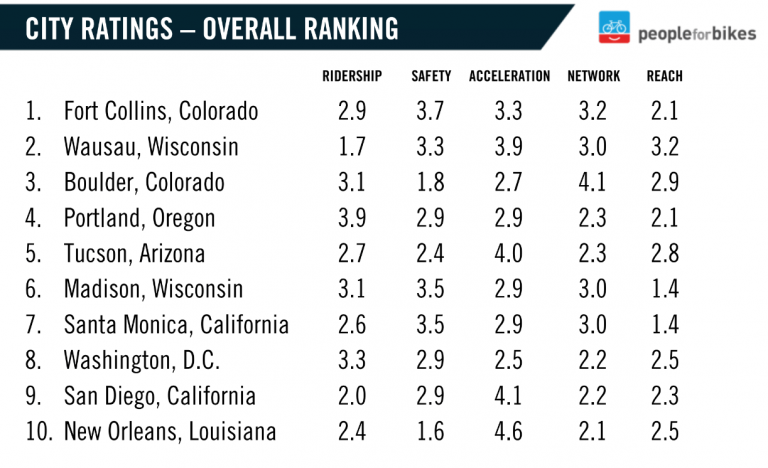 The fact that PFB makes “Acceleration” weighted with “Safety” creates absurdities like San Diego ranking 9th overall. No one who bikes San Diego would say it’s better than Davis for cyclists (or even pedestrians; all the damn SD crossings that *require* people on foot to press a button to receive a “Walk” signal… shoot!? So unfriendly to non-car folks there). My once bike hating 30 something niece and her friends living in PB are starting to cycle for regular errands purely because of inspriation from the bike & scooter share. How well does your city work for bicycling? PeopleForBikes wants you to weigh in for a new city ranking that will be released in the fall. Interior Secretary Nominee Is a Friend to Cyclists — and Oil Drillers?